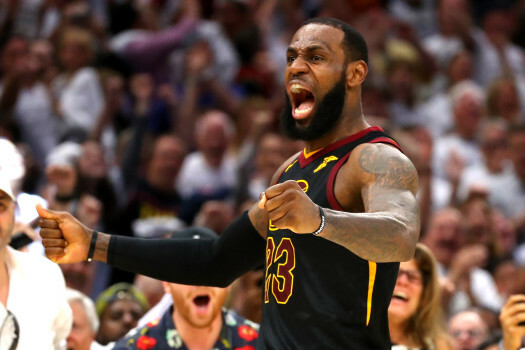 MANILA, Philippines – It took LeBron James and his squad 7 straight games to win the Eastern Conference Championship after beating the Boston Celtics in their homecourt, 79-87 on Monday, May 28, 2018 (Manila Time) at the TD Garden in Boston, Massachusetts, USA. It was exactly a decade ago when LeBron James lost a game 7. It was against a Paul Piece-led Boston Celtics, ironically. Today, The King faced another do-or-die game 7. But this time, it was against a young and versatile Boston Celtics spearheaded by the 20-year old Jayson Tatum. The question prior to this win-or-go-home game was: Will history repeat itself for James or will it be the perfect time for his vengeance against the team that shattered his dreams 10 years ago? It was a very hostile territory for the Cavaliers as they visited the Celtics in a crucial game. Boston being the 2nd-seeded team in the East, showed Cleveland how to start a do-or-die game with an 11-4 run at the opener. Coach Ty Lue had nothing to do but call an early timeout. LeBron James fired 12 points during the 1st 12 minutes but the Celtics still had the lead 26-18 behind Jayson Tatum’s 9 markers. Cleveland felt the effect of Kevin Love’s absence after being placed at the injury bay due to concussion symptoms which he sustained in an accidental collision with Jayson Tatum in game 6. Without Love, James single-handedly carried his team on his back. Midway of the second, aside from LeBron James, Tristan Thompson and Jeff Green were the only Cavaliers who had scored for the team with 4 and 3 points respectively. The Cavs slightly caught up with Celtics after the 1st half 43-39. LeBron James still led all scorers with 17 while Al Horford jotted down 14. Cleveland managed to level the score at 47 in the 3rd period. JR Smith who was cold in the previous games finally contributed significant numbers during his team’s scoring run. Great team effort showed by the Cavaliers as they finally snatched the lead from the Celtics at the end of the penultimate quarter 59-56. LeBron James posted a double-double with 23 points and 12 rebounds entering in the final canto. 4th Quarter is normally winning time for The King. As soon as James stepped on the court for the final period, he drained flawless jumpshots and attacked the rim relentlessly. Refusing to end his season, Rookie Jayson Tatum battled it all out against LeBron James in scoring. Tatum registered 24 points with 5 minutes left in the game and posterized LeBron James with a dunk. Cleveland started to melt the clock down with a 7 point lead and 1:16 left. This time, Boston hit the panic button and began taking 3 pointers but badly missed. At the end of the buzzer, the Cavaliers officially booked the first NBA Finals slot with a convincing win over the Celtics 87-79. With the win, Cleveland will be in the Finals for 4 consecutive years while LeBron James made 8th straight Finals trip. The King finished the Celtics off with 35 points, 15 rebounds and an assist shy for a triple-double. The Cavaliers now await the winner of Golden State Warriors vs Houston Rockets in their own do-or-die game 7.